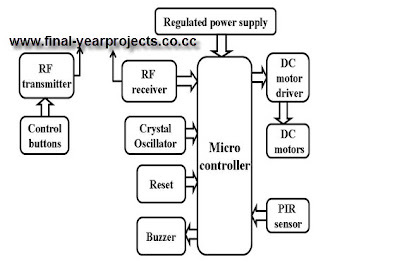 This is a good Electronics and communication project report on Wireless Live Human Detection Robot using PIR sensor and this Project deals with live personal detection robot is based on 8 bit Microcontroller. This Robot follows which is drawn over the surface. Here we are using PIR sensor for detect the which are detect human. The project is mainly used in the DEBRIS for Earth quake rescue. The hardware component used in this project are power Supply, Micro Controller (At89S52), Dc Gare Motor, Relays, PIR Sensor You can also Subscribe to FINAL YEAR PROJECT'S by Email for more such Projects and Seminar. The above image hows the block diagram of Wireless Live Human Detection Robot using PIR sensor. The report also contains Flow chart and Algorithm, circuit diagram, microcontroller source code programming, circuit description and working etc. Use this project only for your reference and study work.